The event, which took place at the award-winning luxury hotel One Aldwych in central London, featured golden eggs, blueberry brioche and playful flavoured candy floss, inspired by Charlie and the Chocolate Factory. 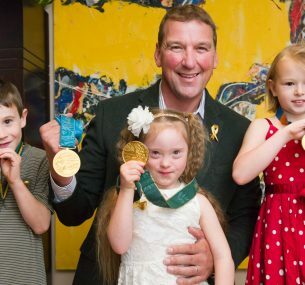 Sir Matthew Pinsent showed all of his four Olympic gold medals to the children, who were clearly thrilled. Children who attended included seven-year-old Bethan Evans from Welshpool in Wales who had Ewing’s sarcoma aged five, six-year-old Hollie Evans from Bridgend who had leukaemia aged 14 months and six-year-old Luke Everett, who suffered from hepatoblastoma, a rare liver tumour, aged six months. The hotel supported CCAM by illuminating gold on 1st September and have been raising funds for Children with Cancer UK for the past two years. They have raised over £30,000 to date.